ChickenSoup Foundation is a philanthropic organization that strives to provide basic services and help to children in Hong Kong who are living in poverty and do not receive adequate level of services in education, health-care and personal development. Students first need to have lectures held by ChickenSoup Foundation to learn the skills of teaching. Afterwards, they will teach a group of students from Asbury Methodist Primary School English skills. Every tutor needs to design the way of teaching to ensure that the concept explained can be clearly understood by every student. Students will be allocated to a community center founded by Asbury Methodist Social Service organization to help primary students as a homework helper every week. They need to help the primary students to solve difficult questions in their homework and explain the concept behind in an understandable way to the students. If the students have already finish doing their homework, our helpers will guide them to do activities and revision to strengthen their communication skills and develop critical and logical thinking. In these programs, students not only need to be patient in teaching, they also need to use their creativity to design teaching methods when explaining difficult concepts to young children in an understandable way. 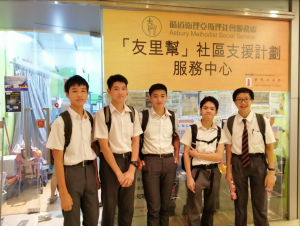 Through the program, they will also realize the difficulties and problems that many Hong Kong students are facing nowadays and understand the importance and significance of voluntary services towards the children who are in need of help. In addition, through different activities, our student helpers can get more experience in interacting with and taking care of young children. Therefore, through this program, the three goals, Creativity, Activity, Services are all well achieved. Ryan Chan: Chicken Soup Foundation Tutorial was certainly a fun and interesting experience for me. For the programmes. Students were to assist primary school students with their homework progress, and also help them academically whether it be revision or questions they have in general. The activity also gave us a chance to interact and play with them after their daily workload has been finished. I was tasked to the Tsuen Wan centre on Wednesdays and helped the teacher at my table whenever assistance was required. This differed a little from my expectations as I thought that us students would be creating different materials for the students to study prior to the experience. Usually, the children would be able to finish their assignments by 18:30, but there were some students who had short attention spans and had to constantly be reminded about focusing on their homework. This was quite a problem because these children would not listen to the teachers or the student helpers at times, and more effort must be taken to counter this and get them back on track. Furthermore, it is even more difficult to do so when there are seven to eight students to manage at once. Often I am frustrated as I tell them to continue working, but to no avail. Chicken Soup Tutorials have taught me how to be patient with children and understand another’s struggles. Not only does the programme serve as an opportunity to brush up communication skills, but it also requires a balance between toleration and discipline. When teaching the children, they may not be able to understand what one is trying to convey if the dialogue is rather unclear or too difficult. Breaking down the concepts and answers is required at times, but it presents a challenging process as we have to limit ourselves from exposing the answer and not let the children do the thinking themselves. For the best interests of the children, we also had to be tolerant with them and be considerate when they did not understand what we said. Critical thinking is important as we try to find other phrasing and terminology that they would be able to understand. On the other hand, we wish to encourage and remind the children to keep focused on their work with positive motivation, such as reminding them of the break after completion of work or rewarding them with stickers. This toleration is hard to achieve because it takes time and effort to do so calmly. However, there are times where this is not enough and sternness is required, especially when the child has been distracted multiple times. A balance must be achieved between the carrot and stick in order to make the children listen to you. To my understanding, not every single child in the tutorial centre were as lucky and privileged as us. Some of them were new immigrants from China with little knowledge, some experience difficulty in absorbing the knowledge taught at school, and some had mental illnesses that prevents them from studying well. This phenomenon is not limited to the Chicken Soup Tutorial centre, but also the whole of society. I believe that we should show more compassion to this side of the society and not to discriminate, but help them integrate more with the society. Patrick Chu: For the Chicken Soup Tutorial, the service turned out to be more difficult and challenging than what I expected as the primary students are people after all. They will be disobedient, or fail to follow my instructions. Therefore, it was important to control my temper and teach them patiently, especially as I am an impulsive person. This activity was a meaningful and wholesome one, though as I was able to teach the children new skills and personal experiences and help them to cope with their academic work. Through assisting the children, I’ve learnt how to communicate successfully and patiently as the children might be active and disobedient at times, this helps me to train for skills in the future when I need to communicate with others. In order to obtain the best agreements and decisions, I should communicate with them patiently and successfully. I’ve also learnt how to moderate arguments, as the children occasionally quarrel with each other. This skill benefits me greatly as I will have the ability to mediate between peers and create a harmonious environment. Oscar Choi: Going to the Chicken Soup Tutorial Centre was a new and interesting experience. At first, when I heard that we would be going there as teaching assistants, I naively believed that we would have an easy time as primary level knowledge would not be able to trouble us. However, I was gravely mistaken. Teaching a primary student requires great patience and technique. The fundamental problem lies not within your scope of knowledge, but whether the child can be enlightened by your teaching. At first, it was difficult to explain theories and concepts which I already learnt to children as we were looking at it from different perspectives However, as time passed, I started putting myself into their shoes and could deduce where the heart of their misunderstandings lay. The act of divulging the situation from others’ shoes is not an action that should only be practiced only when teacher others; rather, it should be applied to daily life. For example, when you have an argument with others, when you try to relieve somebody of their pains, etc. As humans are social beings, it is a virtue to be able to view the world from another’s perspective from which oneself could benefit greatly when developing in a society. Going to the Chicken Shop Tutorial center, it was a new and interesting experience. There, I was tasked with assisting primary children with their homework and guiding them to study. At first, when I heard that we would be going there as teacher assistants, I ignorantly believed that we would have an easy time as the primary level knowledge would not be able to trouble us. However, I was gravely mistaken. Teaching a primary student requires great patience and technique. The fundamental problem lies not within your scope of knowledge but whether the child can be enlightened by your teaching. At first, it was difficult to explain theories and concepts which I have already learnt and accepted to the children as we were looking at it from different perspectives. However, as time passed, I started looking from their shoes and could deduce where the heart of their misunderstanding lies. The act of divulging the situation from others’ shoes is not an action that should only be practiced only when teaching others; rather, it should be applied to daily life, for example: when you have an argument with others, when you try to soothe someone of their pains, etc. As humans are interactive beings, it is a virtue to be able to view the world from another抯 perspective from which oneself could benefit greatly when developing in a society. In the Chicken Soup Tutorial center, it is arranged for us to manage seven to eight students at the same time. When I first started, it was certainly difficult to cope with all the cries of help and laments of frustration. However, I became more and more proficient in handling such occurrences by communicating with the children and reassuring them that I will aid them soon. In addition, there were cases where the children get angry or reluctant to continue in their studies. At first, I was confused and helpless in handling such situations. Nonetheless, as my experience accumulated, I gained the insight to determine how to correctly react to various students as different people have differing personalities and a unique method to work out the situation. This honed my skills of communication and instant thinking which will benefit me in all walks of life.